Sliding knots can be performed in many situations during an arthroscopic procedure. Their use is possible in quite all conditions w here a tissue should be fixed using a suture as in rotator cuff tear repair or Bankart repair. Many knots are described and performed by arthroscopic surgeons. Aim of this chapter is to describe the principles of sliding knots and create a practical guide for surgeons to learn in an easy way the most famous knots. 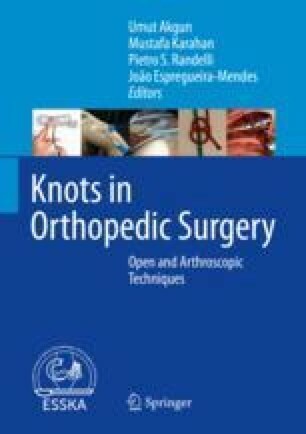 This guide could help youn g surgeons to learn the basic knots and expert surgeons to learn new techniques. The most famous knots have been described using a step-by-step description and images, to make them more reproducible.